In 1972, a boxcar from Toronto containing a menagerie of farm animals and an eager young couple pulled into the station platform in Kingston, Nova Scotia. They were bound for a deserted hundred-acre farm on the South Mountain, determined to preserve the foundations of farmsteads past while constructing a geodesic dome. They were pioneers of the future, armed with respect for tradition and an irrepressible sense of humour. They didn’t call themselves farmers. They were back-to-the-landers. Farming was industry and their calling was sustainability. Over the next forty years, through flood and fire, triumph and catastrophe, they persevered, unwittingly sowing the seeds for the modern small-farm movement. When I went to buy my favourite Cortland apples the other day and was told that, due to a huge frost kill this year, they would be in short supply, it sparked a memory. I was born on the bald Saskatchewan prairies in the 1940s where fresh fruit wasn’t easy to come by. Much of the food my mother prepared was things she’d learned to make do with during the lean years of The Great Depression. We were farmers and there was no shortage of plain food on the table: there were things we raised ourselves, and Saskatoon berries, raspberries, and blueberries that could be found from places a buggy ride north of us. But that was about it. If we couldn’t afford to buy the fruits shipped by rail from the nearest source in the Okanagan Valley in British Columbia, we went without. Why then, considering the circumstances in those years, do I have such fond memories of my mother’s wonderful apple pies? The truth is she was putting us on. They weren’t really apple pies at all- they’d never seen an apple- they were, when we later discovered her trick, what we kids called cracker pies. 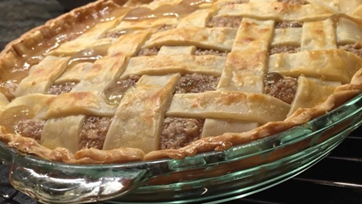 For a long time I thought she had invented the concoction but I have now found out that the recipe has been in universal use for over seventy-five years and known as Mock Apple Pie. As I recall, it was printed on the Ritz Cracker box! Try it out—it’s easy to find online and delicious as well as foolproof. Better yet, find some local Cortlands and bake a REAL apple pie!